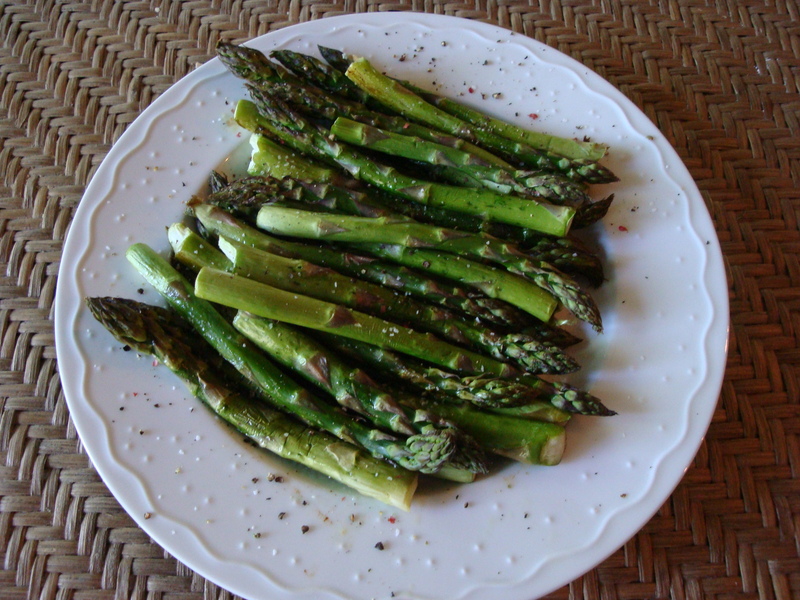 Asparagus – keep it simple! My sister-in-law, Cindy, and I had a conversation recently about which is better – thick or thin asparagus. There are lots of different opinions out there about this, so I decided to ask the expert. Instead of answering my question directly, Russ offered me a piece of raw thin asaparagus. He then asked me to remember that taste and offered me a piece of thick. What I experienced is that the thin had a sharp and strong taste, while the thick was juicier and sweet with a milder taste. I think thick wins! As my guy, Randy Tatum, says . . . with asparagus this good, it doesn’t need to be “tarted up”. 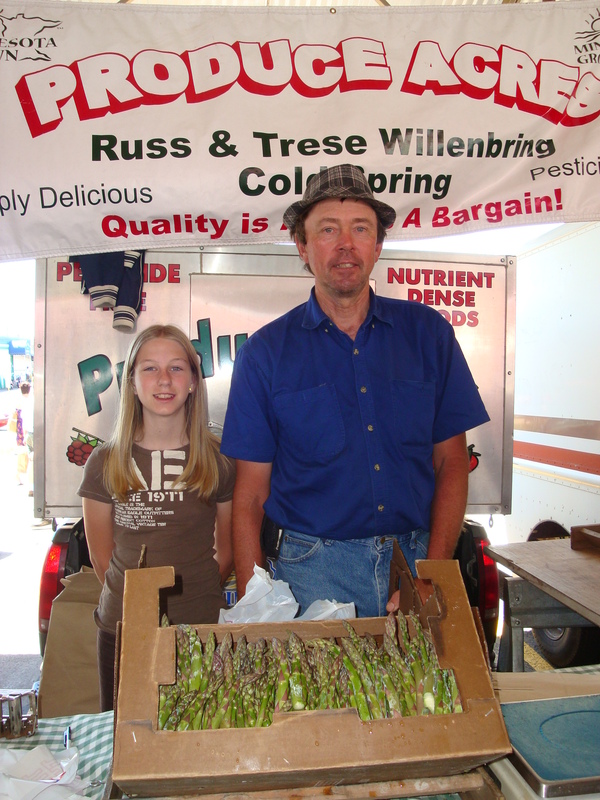 He makes great oven roasted asparagus – scroll down to see his recipe. We’ve steamed, grilled and oven roasted asparagus and we keep coming back to the oven roasted as our favorite. Don’t forget our recent post on Asparagus and Chorizo Tortilla, and this recipe for Shaved Asparagus Pizza looks really good although I haven’t made it. Preheat oven to 425F. Line the bottom of a cookie sheet or bottom of a broiler pan with foil. Lightly coat the foil with olive oil. Place the asparagus on the foil and roll it around to coat with the oil. A tip from Randy is that too much olive oil will make the asparagus steam rather than roast. If you have different thicknesses of asparagus, place just the thick ones on the foil to start. Roast these for about 4 minutes and then place the thin ones on the pan and roast for another 6-8 minutes until done. They are done when a fork can pierce the stalk, but they still retain their green color. Sprinkle with kosher salt and cracked black pepper to taste. You can fancify this with some lemon zest, parsley or minced shallots, but the idea is to let the deliciousness of the asparagus shine through. You can serve hot or at room temperature. 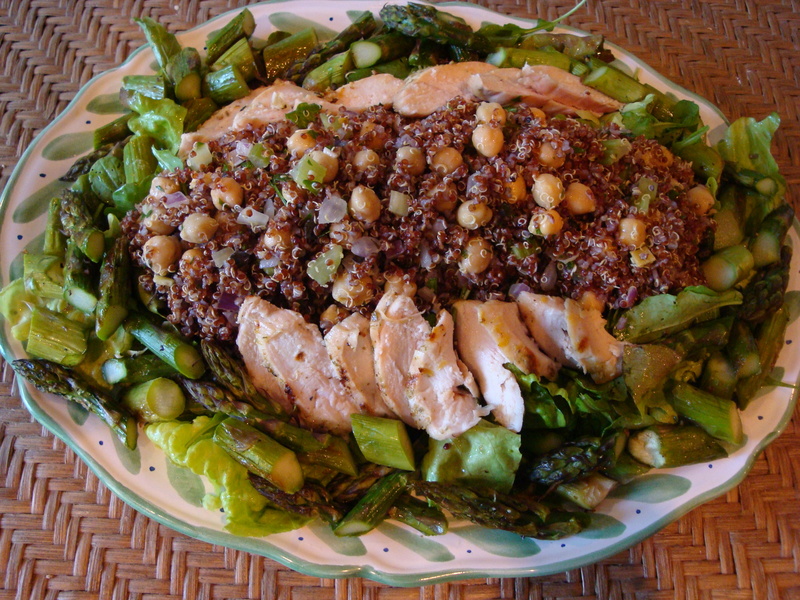 We used the asparagus on a platter salad, which included leftover chickpea salad combined with red quinoa along with grilled chicken served on a bed of butter lettuce and arugula.